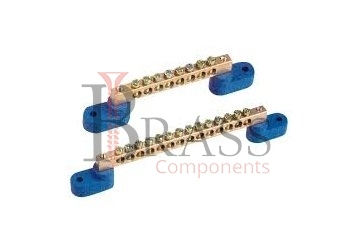 DIN Rail Terminal Blocks are manufactured from brass, copper, stainless steel, aluminium, polymer, polyamide or any material composition as per custom specification. DIN Rail Terminal Blocks are available in variety of configuration including single level, double level, triple level, feed through, fuse, ground and more. DIN Rail Terminal Blocks are internationally approved. The standard range of DIN Rail Terminal Blocks are available in electric tin plated, zinc, copper, chrome, natural brass, nickle plated brass or any plating, coating and finishing as per custom specification. Provides an excellent vibration proof protection against loosening. Available with superior electromechanical properties. Assure high pressure contact force and voltage drop. High Contact Pressure and Low Voltage drop. Easy Handling and Safe Connection. Provide easy mounting and dismounting from the terminal rail. Highly reliable, durable and maintenance free. Guarantees vibration-proof and maintenance free connection with high contact forces. Ideal for Industrial Power Distribution equipment and control panel wiring applications. Facilitate the connection of panel mounted electronic components to device power and field wiring. Provide Quick, Clean, Safe and Efficient Installation. Available for high current application and for specific function application. We manufacture DIN Rail Terminal Blocks as per Custom Specification and export in Germany, Spain, Netherlands, Portugal, UK and other European Countries. For more Information, Please Contact Us or Inquiry Now.